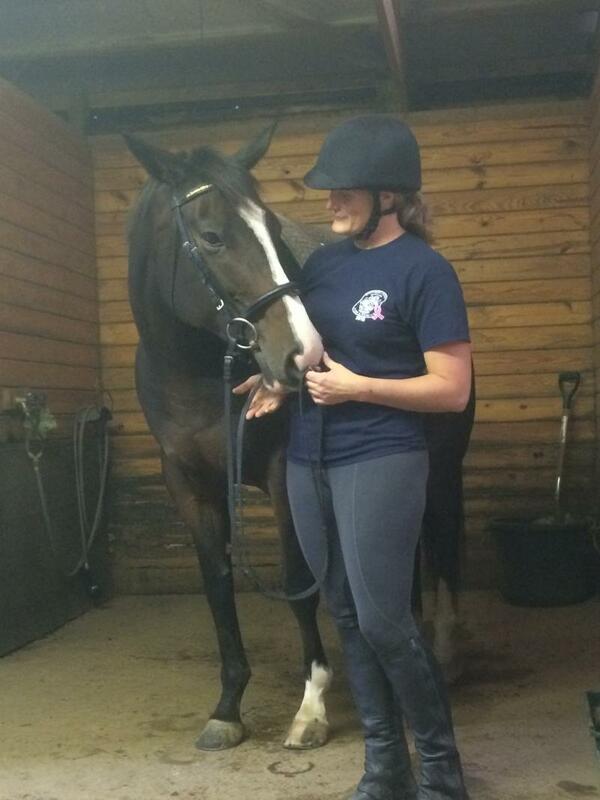 The horses in our herd are the real teachers at Encore! Each one is on his own personal journey that our students share and learn from what that horse knows, doesn't know, and how he likes to be communicated with. 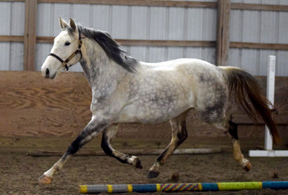 The horses come from a wide variety of backgrounds and experiences, but all are on a path towards becoming the most athletic, balanced, and well-rounded they can be. 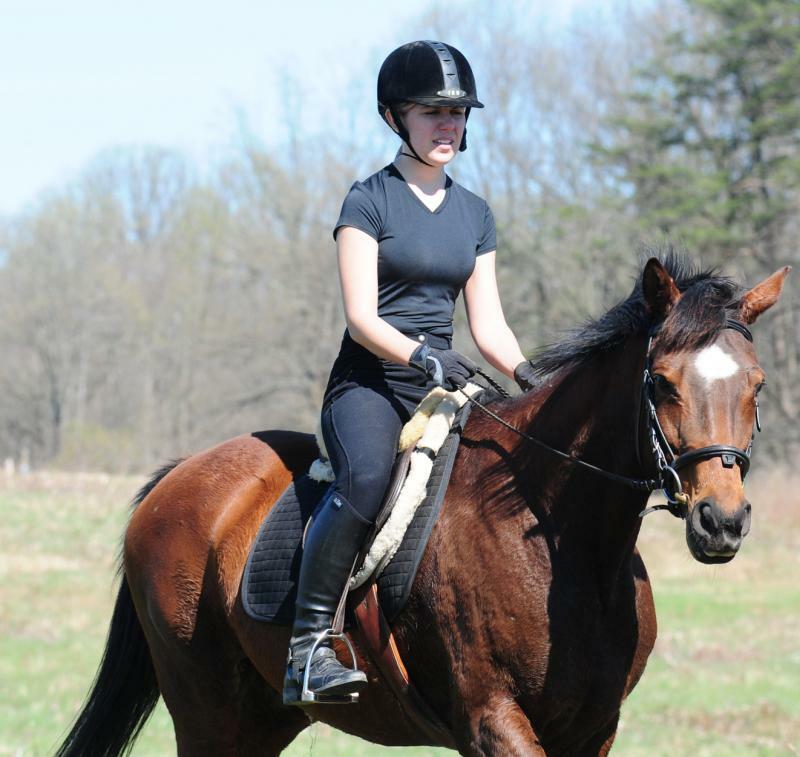 Some are professional school horses coming to us from other lesson programs, but most of them are privately owned horses who have had full show careers, trail riding experience, or racing careers. We even have some young horses who have either been born with us or come to us early in life and are being brought along. 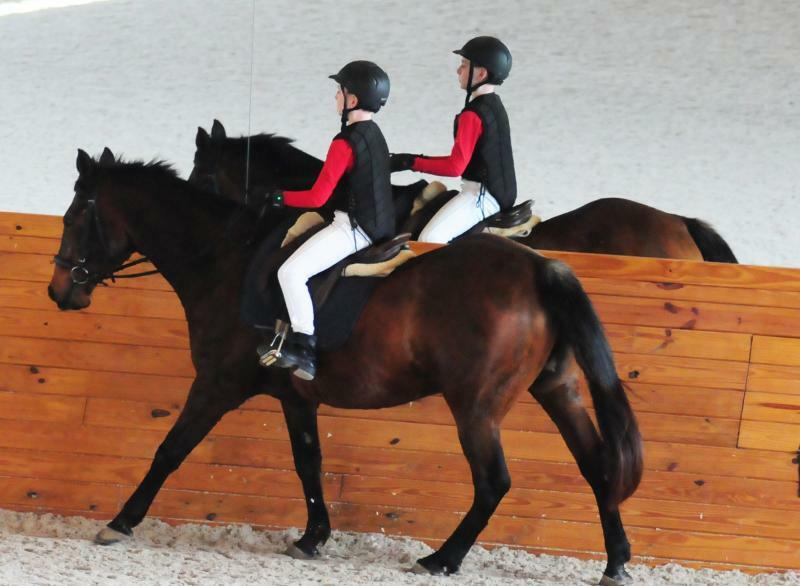 Special young horse classes are held for interested students who wish to learn how to work with babies and green horses. Kate is a talented mare with a flare for the dramatic! She's got three incredible gaits, floating over the ground with elacrity and grace. She loves an audience, the bigger the better! She teaches her riders how to finesse their aids, think their movements, and flow with the horse. All that talent comes with the price of sensitivity and confidence found especially in mares so riders discover if they are "mare people" or not! 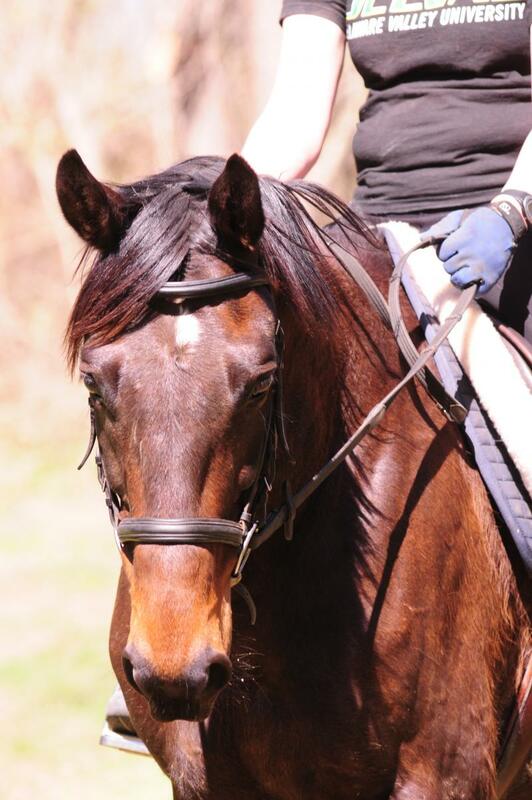 Pogo is a quarter horse who came to us as a diamond in the rough, not having much formal education in the ring, though kind and willing to try. He gives students confidence at the sitting trot, helps them learn to carry their hands and ride from their core, and bend through corners. He's just lovely! 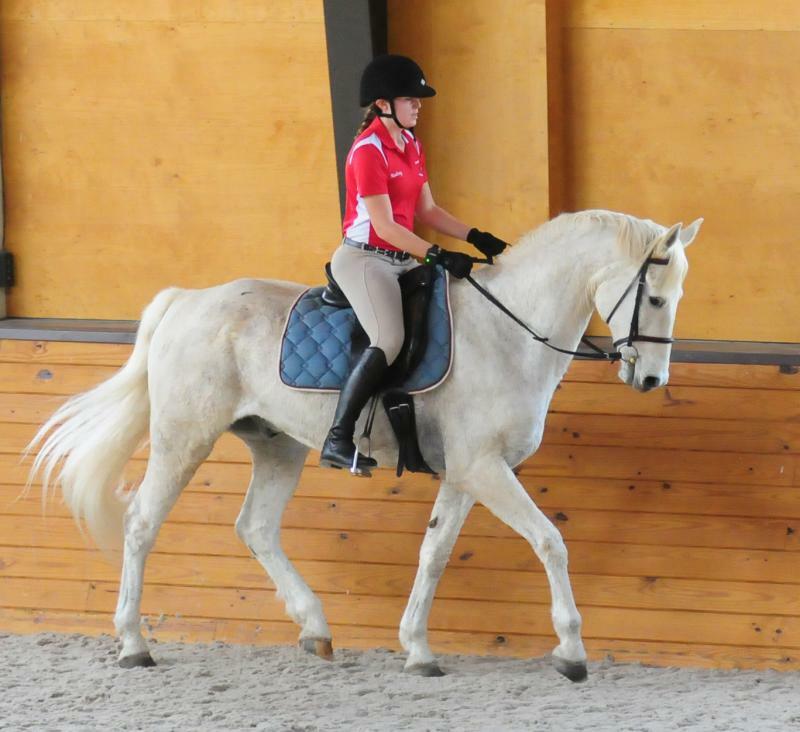 In the short time he's been with us, he has become one of the all-time favorites by all levels of students as he is developing his engine and really enjoys all the bending exercises that are helping him become a very balanced horse with very correct muscling. Everyone has enjoyed seeing him transf﻿orm into a very elegant guy! Pacino came to Encore's program in an unusual way. He was brought to us because he needed some medical support for a badly ulcerated eye that we were in a position to help him with.Once here, he settled into our routine so nicely and seemed to really enjoy the attention so we approached his owner about having him join our program as she herself is a new mom with time constraints. Pacino was a PMU foal (Premarin), which means his mother was bred for the sole purpose of collecting her urine while pregnant to create a hormone replacement treatment for menopausal women. 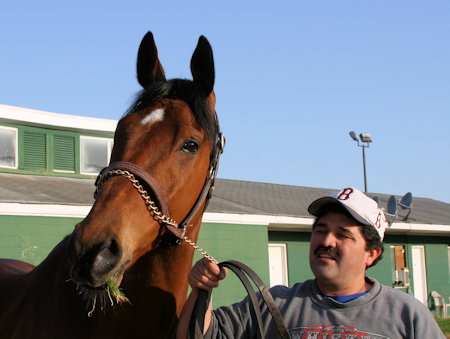 Pacino's owner picked him out from a photo as a baby and had him shipped across the country as a weanling. This lucky guy has been primarily a pasture companion and friend to his mom, but it turns out he likes being a riding horse too! 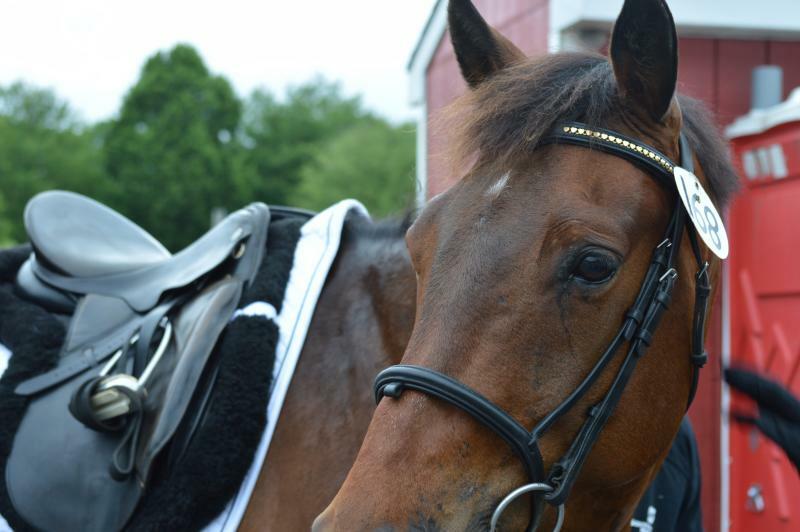 Since joining us, Pacino has become a favorite for riders, especially doing gymnastics over fences. ﻿Smokey is our lunging horse extraordinaire! Beginners spend weeks working with Smokey to get their balance on the lunge line, learning to use their seat and legs prior to taking up the reins, much like the students at the Spanish Riding School in Vienna. Smokey is a great guy for learning to properly bend a horse through their body, ride forward, and understand how to "carry your hands", not relying on hands for balance for steering. He's just an all around good guy who really appreciates grooming time and has a special passion for peppermints! 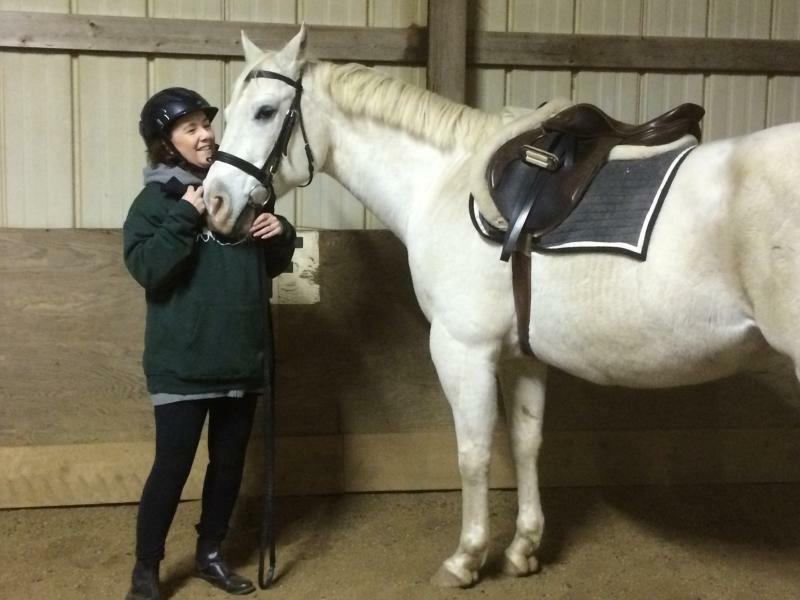 Smokey the Grey is shown here with our lovely student Jennifer who's husband bought her a lesson package as an anniversary present. 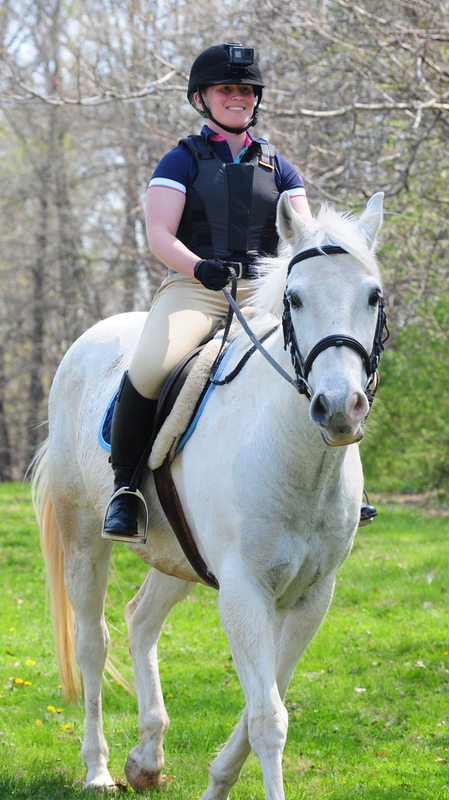 Unfortunately, Jennifer developed cancer after riding diligently for six months and passing away shortly thereafter. Riding Smokey was something that made her smile every week, and he loved her too, whinnying when her car came down the driveway. Maybe is an off the track Thoroughbred and one of those horses that everyone who meets seems to fall in love with. She is the mother of Promise, her 2015 foal. Now she teaches Encore students how to create a proper bend, maintain it, and feel when it is correct. She shows them the way when it comes to riding a horse from back to front, and how to keep energy through circles and bending lines. 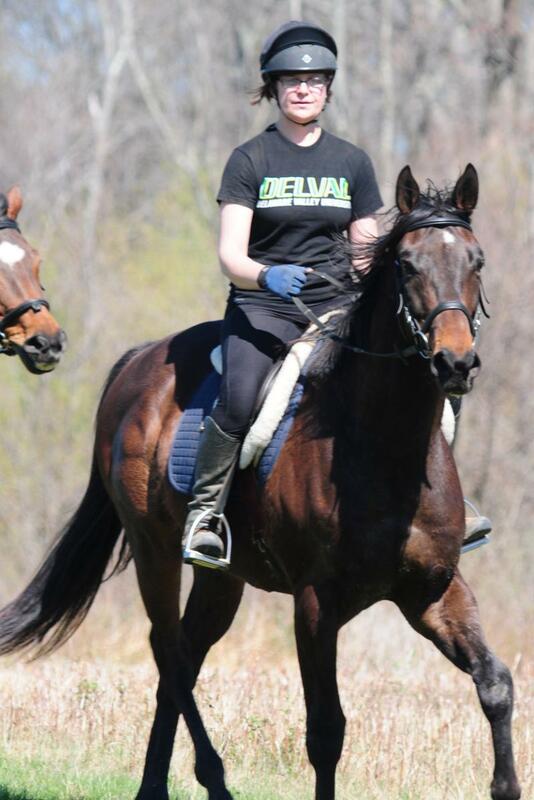 Andrew is one of our super fun off the track Thoroughbreds who is enjoying life as a riding horse. 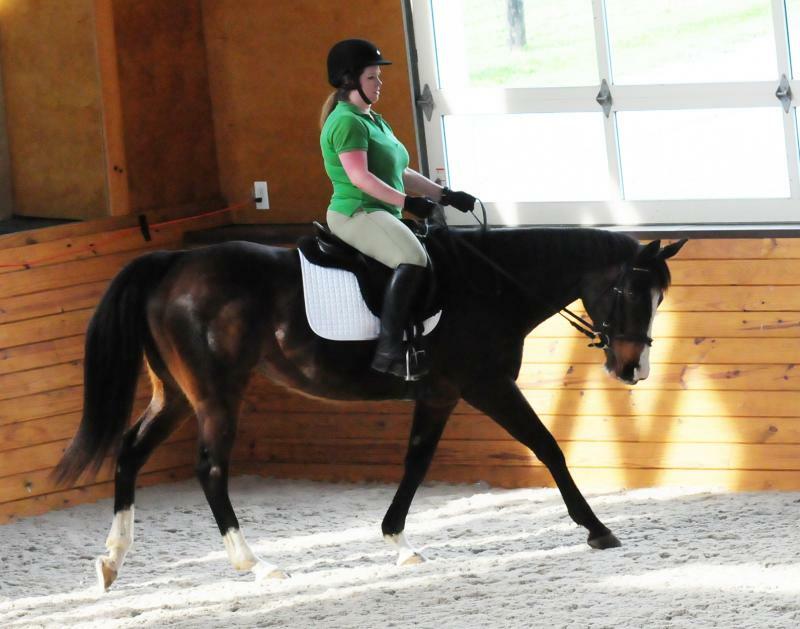 He is light off the aids gives riders confidence riding a horse who is naturally forward. 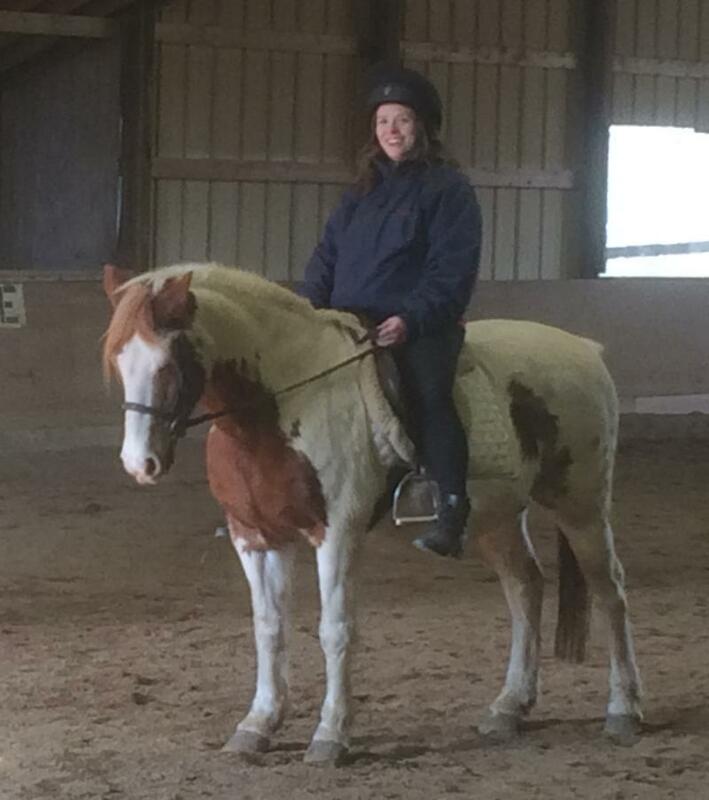 Andrew is ridden by our more experienced riders who have achieved an independent seat and leg. He's a nice ride for those moving up! Hidalgo is an Appaloosa on loan to us from one of Horse Jitney's shipping clients. Hidalgo is a wonderful horse who is a terrific teacher. He's very patient and waits for his rider to "get it right". He's a good guy and brings a sense of humor to Encore. Students love his spots and enjoy the game of finding the dog and paw prints in his spots. The Indians say a horse that has other animals in their coat patterns is a very special horse indeed, often used by the medicine man or Shaman within a tribe. Moonie is a very cute paint mare with blue eyes. She came to us on loan from one of our clients and has quickly become a favorite of adults and kids. Smokey Cody is a very kind guy who has extensive show experience at horse trials and in dressage and hunter shows, and he loves to share his knowledge with his passengers. He has a wonderful can-do attitude, rewarding the rider for their efforts with "a little more" and "a little more" each time they ask. 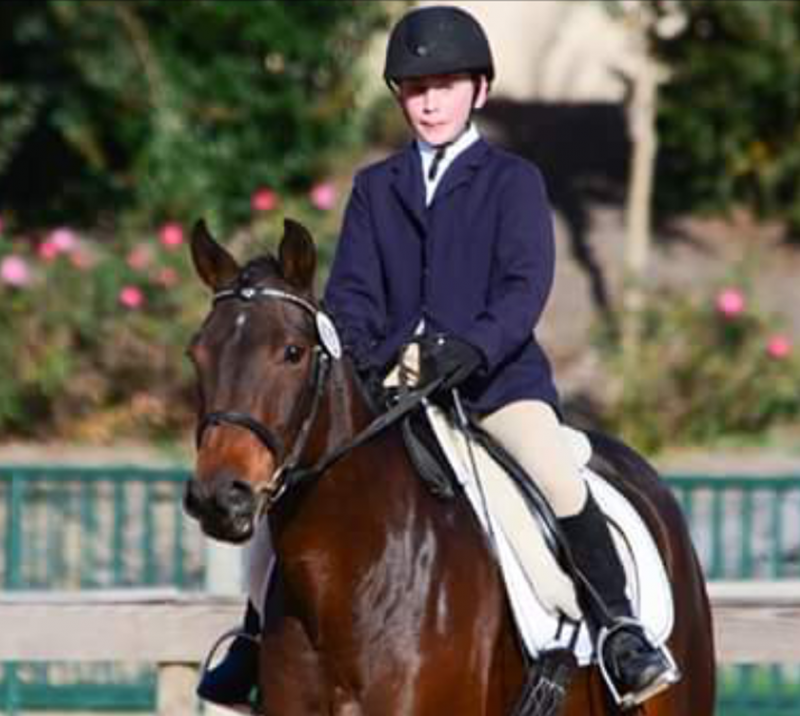 Smokey and junior rider Michael Neschis were reserve champion of PVDA's Clarksville Chapter's 2016-17 winter series dressage show at the Intro level. Granix, aka Granny, is a special guy we are lucky enough to have join our riding program while his mom is in school to learn the art of equine massage. Granix is one of those wonderful willing, unflappable guys who tries his heart out to understand what his rider wants. 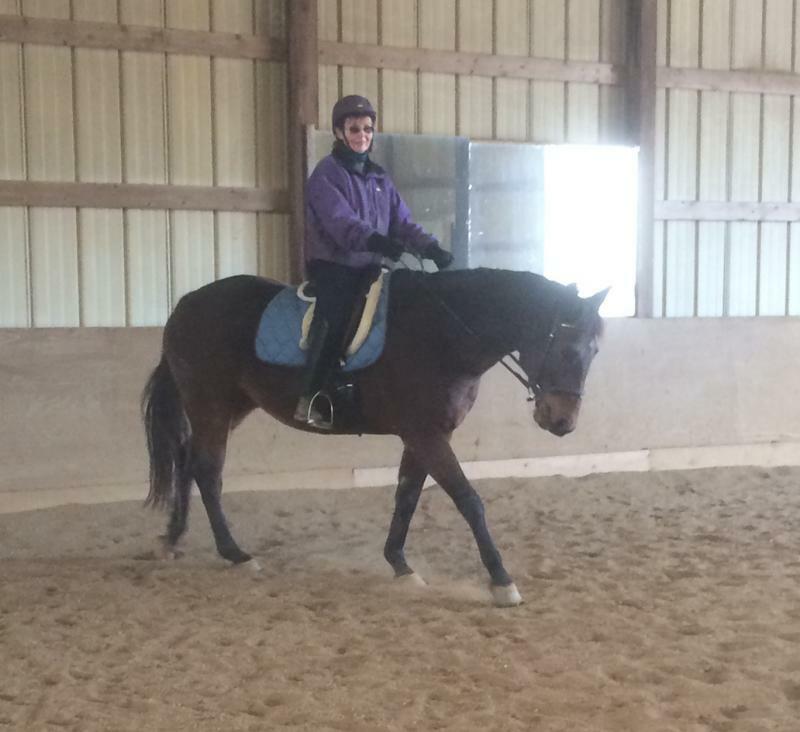 Granix loves to jump, especially cross country and is adding dressage to his repertoire while in our program. Everyone needs a pony to humble themselves with, and Pirate does not disappoint! He's a self-assured guy who can either ride like a pony or keep up with the big guys with a big, long trot stride. 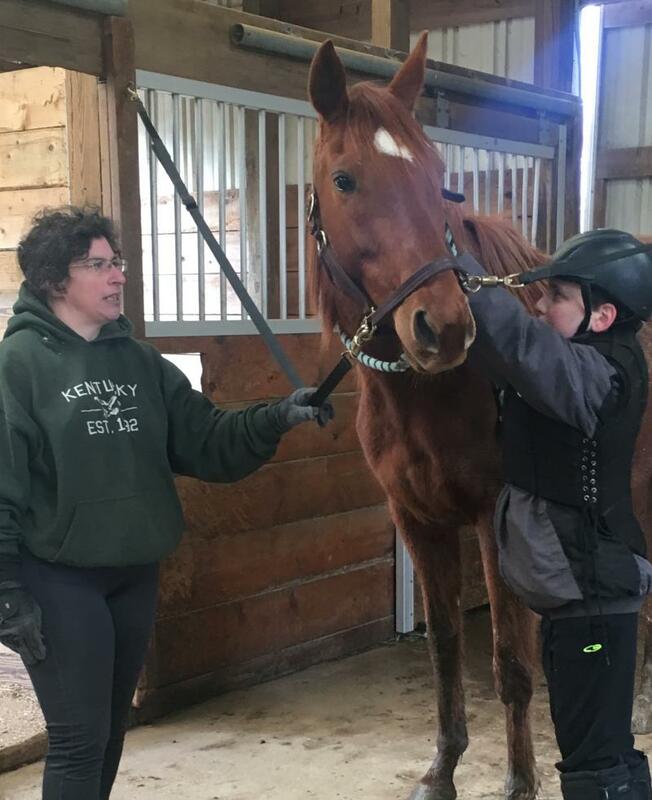 He teaches students to ride every stride and get comfortable pushing a horse out ahead of their legs, riding the canter, or bouncing through a series of jumps. He's also what we call an opportunist! He's a master at dragging the unsuspecting into a stall of his choice, cutting his corners, and nipping your behind, but he's worth his weight in gold in giving students confidence. We just love him! Track Magnet raced until he was 10, and in fact raced exactly 100 times. He had only one owner from the time he was a yearling until his retirement in 2016 when he came to us. Magnet and Jordan were both owned and raced by the same trainer, a friend of ours who asked us to take them when done racing. Magnet has one eye, but don't let it fool you, he's quite comfortable with it. He lost his eye in a trailer accident when he was three years old, but learned to live with it and continued racing. We taught Magnet to lunge using voice commands and change in body position on his blind side in just one session. He is an incredible athlete and can jump the moon. Students learn to be comfortable with a big moving, forward horse by riding Magnet. He is a loverly mover, built very much for eventing. We expect Magnet to join us at local shows this summer, to add to his currnet dressage show and trail riding experience. Magnet is also casually for sale as he would love his own person. He's priced as a prospect and will bring great joy to whoever falls in love with him. Arthur came off the track in 2015 with a severe hind gut disturbance that was caused by his history of being a cryptorchid - in other words he had an undescended testicle which had to be surgically removed. 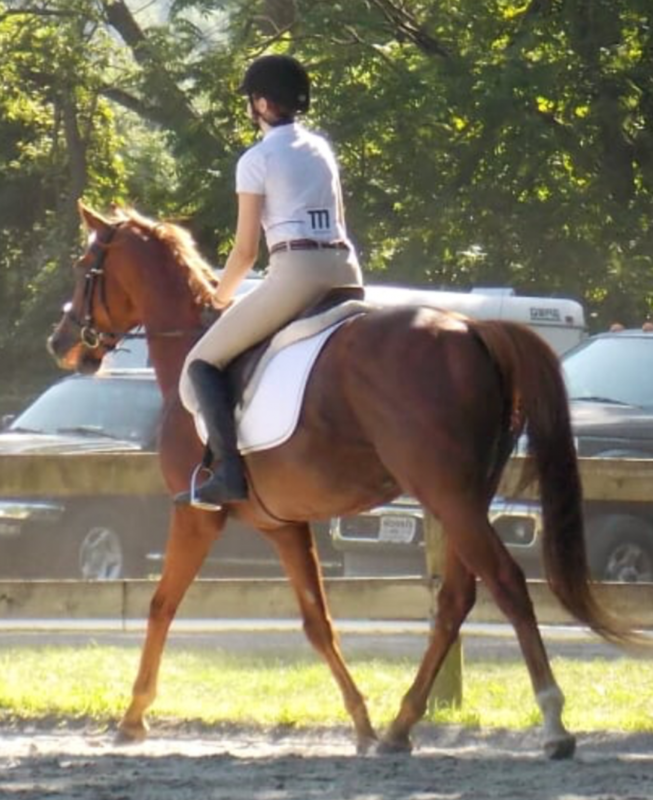 We have worked with nutrionist Dr. Vandergrift, creator of Triple Crown feeds and Dr. Amber Langmier to re-align his pelvis and lumbar which has been the root cause of his underlying soreness and alleviate his discomfort. We are pleased with Arthur's rehabilitation from his hind gut disturbance and orthopedic issues so he has recently joined our program as part of his rehabilitation schedule with some of the more advanced riders. He is a lovely, sweet tempered horse who tries to please. He remains in the care of Dr. Amber Langmier of Maryland Anmial Chiropractic and is carefully monitored to make sure he is building correct muscles. 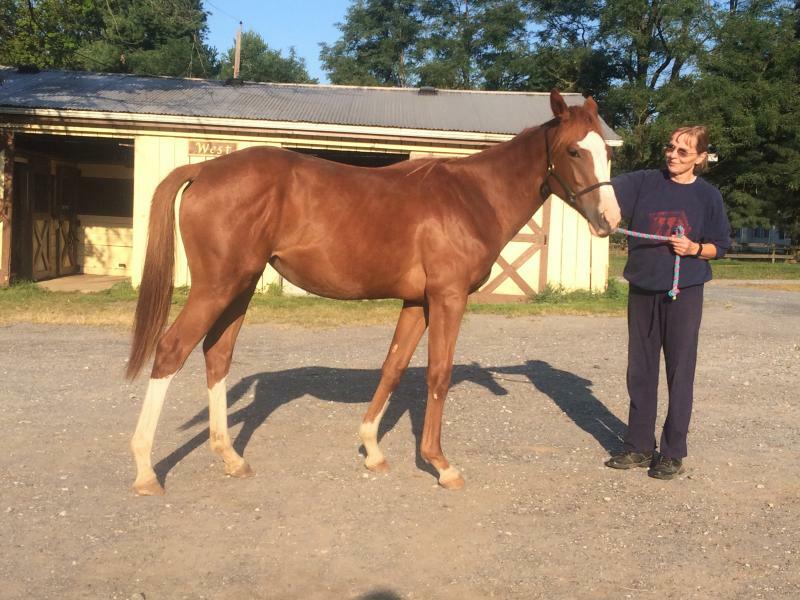 Kitty is a young Thoroughbred who came to us when the owner wanted to put her down because she had suffered a dislocated patella. Lucky for her, our friend Sue called and begged us to take her in. So we named her Saved by Sue. 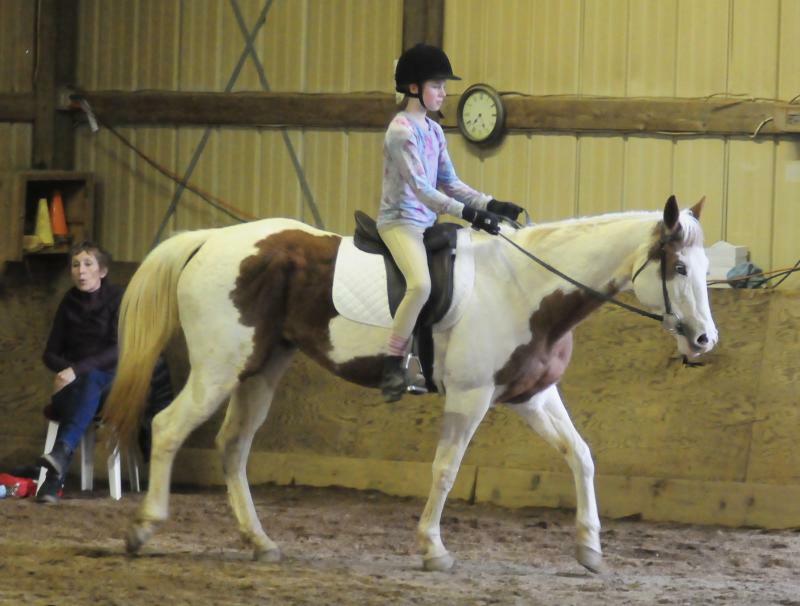 Kitty has participated in the young horse class, and will be starting her riding career this spring. She's going to make a young rider a very nice horse as she has lovely movement, a big shoulder, and yet is a small, powerful package. Not only is she beautiful, but she's the sweetest horse you'll ever meet. Kitty participates in our young horse program where students learn how to bring along a young horse from weanling to riding. She loves everything we do with her, and gives our students confidence working around babies. 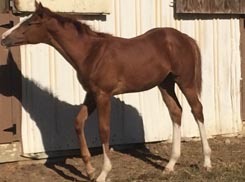 This is our 2015 Thoroughbred filly by Full of Scoundrels out of Mckenzie River (AKA Maybe). Doesn't she has some chrome? She teaches students taking the young horse classes how to approach and handle green horses who are experiencing things for the first time. She is very willing, loves people, and tries to please. She provides students with the unique opportunity to handle babies under direction. Libby is one of our homebred Oldenburgs, in fact Kate's niece. 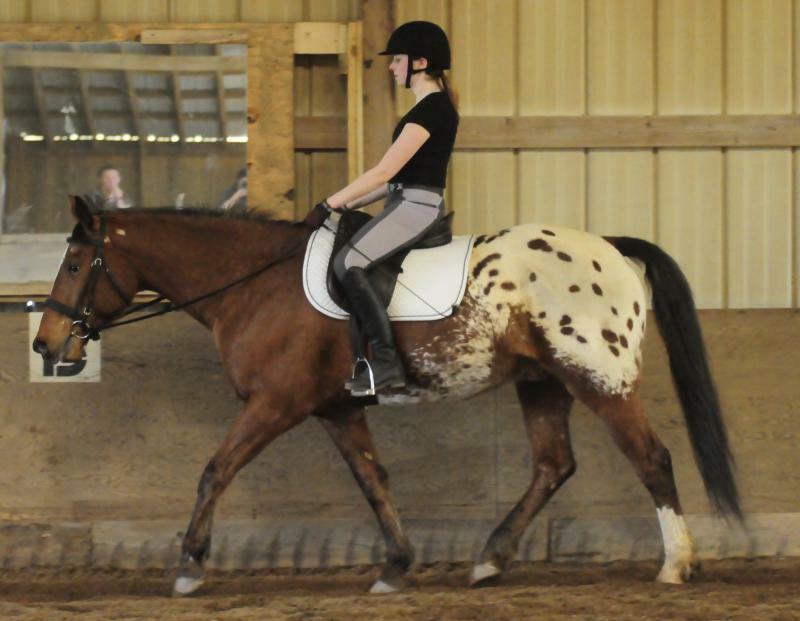 She is a little "autistic" on the ground and sometimes can seem unfocused, but under saddle she is a rock star. She can jump the moon, sometimes demonstrating that talent by jumping out of the arena when free-lunging. She is our comic relief in a very talented package. 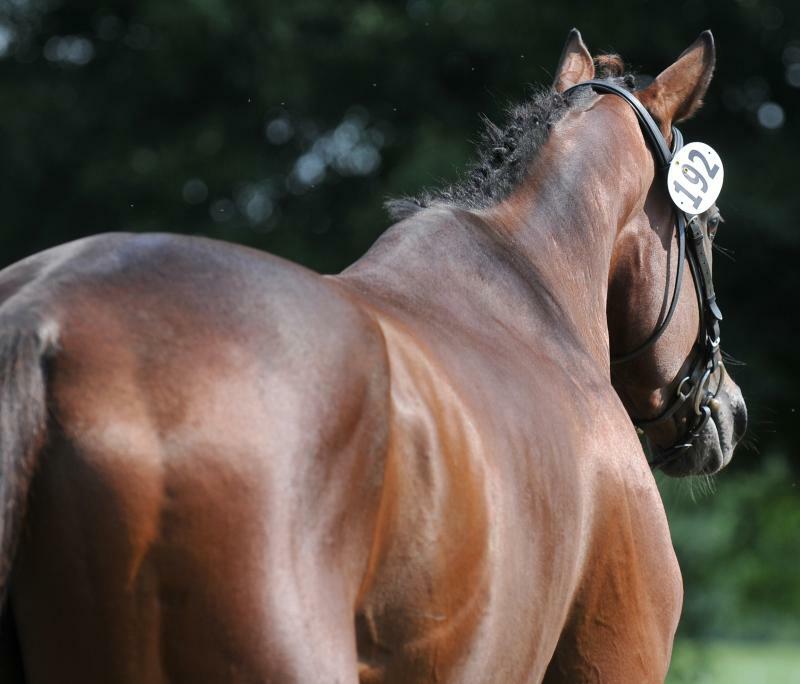 Our off the track Thoroughbred stallion Full of Scoundrels is the sire of Full of Promise. He is a wonderful guy who has proven he throws quality foals, but is, for the most part, afraid of mares. He lives with his best friend Victoria Pool at a separate farm in what is quite simply a platonic relationship. Victoria is one of our off the trackers who really believes she was put on this earth to be catered and pampered. She doesn't believe she is a riding horse and spends her time ruling the barn, keeping Scoundrels in line, and generally accepting humans as her staff. 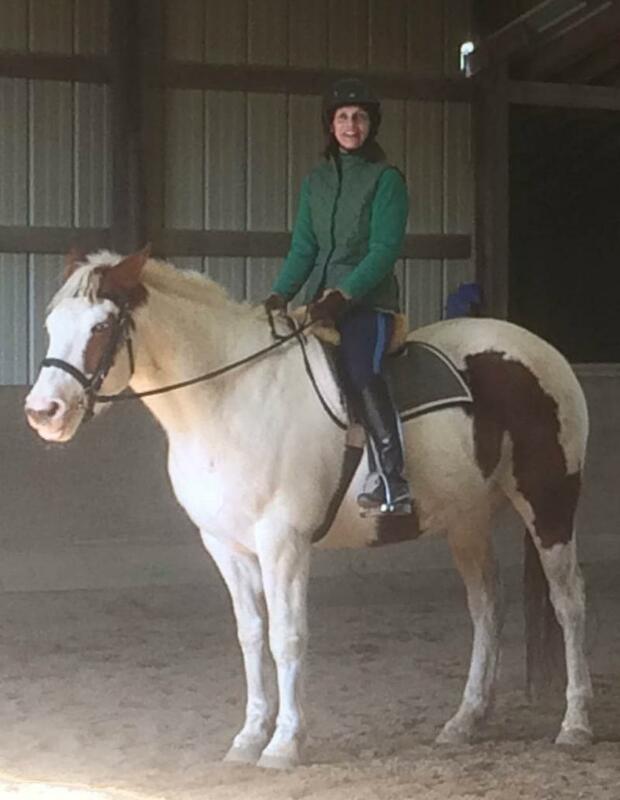 Victoria offers her services as a model for some of our horsemanship classes and Equinars. Donkey is really a hinny - a cross between a female donkey and a male horse. But she looks exactly like Donkey from Shrek so her name is Donkey. She was truly rescued from a very bad situation and now takes her job as Scoundrels' pet seriously.